The Critter Nation Double LevelÂ has earned its reputation and raves as one of the best cages in the world. This cage nearly cleans itself, as the molded plastic trays easily slide out for cleaning. Water bottles and hammocks can be hung anywhere you like and the lowest level is designed with plenty of room for large exercise wheels. Casters make it easy to move and the Critter Nation Double can be configured in many different ways depending on your pets and their needs. 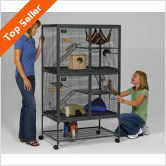 The Critter Nation Double level will last for many years, making it a more economical choice than some cheap pet cages. It may sound crazy to suggest you’ll save money when buying a $200+ pet cage but hear us out first. If properly cared for, the durable Critter Nation cages will last for many years — long after cheaper cages have already fallen apart or latches and hinges have broken. 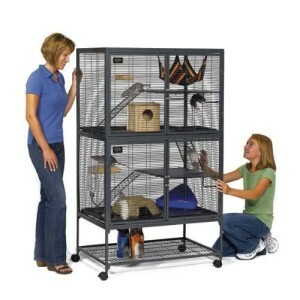 The Critter Nation Double is a huge, roomy cage, with the space maximized and fully utilized. You’ll be able to fit far more pets into this cage, with it replace four or more smaller cages in some cases. You’ll also need to factor in the valuable time that is saved when cleaning Critter Nation cages. Their flexible and smart design can cut cleaning time in half, saving you a massive amount of time over the years. Add all that up and the math is simple. Buy the Critter Nation Double once and save, as otherwise you could easily spend $400-$500 on cages over the years to keep and care for the same number of pets. The Critter Nation Double is also a great choice for anyone with larger pets such as ferrets who need a larger cage with more room than many provide. While the Ferret Nation line of cages is designed specifically for ferrets, many owners use a Critter Nation cage as well since they can be easier to find and are often slightly cheaper. No tax + 2 day free shipping - Click now! "Our five boys LOVE their big Critter Nation cage and so do I. It's easy to clean and my little rat babies have 5 times as much space to play as they did before. - Sarah S."
"My daughter's two rats Marley and Socrates couldn't be happier in their Critter Nation 161. My daughter can clean it by herself and the casters on the bottom make it a snap to bring the rats out to the living room for play time or to watch TV with us, instead of leaving them in the back bedroom like we used to. - Maria B. "